It can be difficult to maintain an energetic lifestyle and stay motivated when winter sets in. With colder days and darker nights, it’s easy to forget that you still need to be active. According to The Physiological Society, elderly people who remain inactive can rapidly lose muscle mass over time, which in turn hinders mobility. It’s hugely important to us that our residents remain engaged in exercise, which is why we offer a wide array of activities every single day. Your loved one’s wellbeing is our main priority, so even if the snow is falling or we’re in the middle of a heatwave, we’ve got plenty to do to ensure that our residents keep moving. NHS online have a great selection of exercises that can be completed from the comfort of a chair or using the chair as a support, with movements including chest stretches and arm raises. It may not be for everyone, but yoga is a gentle form of exercise can help increase flexibility as well as encouraging mindfulness. You could also try Tai-Chi or Pilates. Increase your heart rate with a bit of dancing, just put your favourite piece of music on and you’re good to go, or try a dance class such as ballroom or line dancing. Resistance bands can increase muscle mass, put together with a variety of other weight exercises can make for a solid work out. It may be getting colder, but our residents still have the opportunity to wrap up warm and take a gentle stroll around our stunning grounds, taking in the crisp winter air and enjoying the beautiful sights of the Vale of Aylesbury. 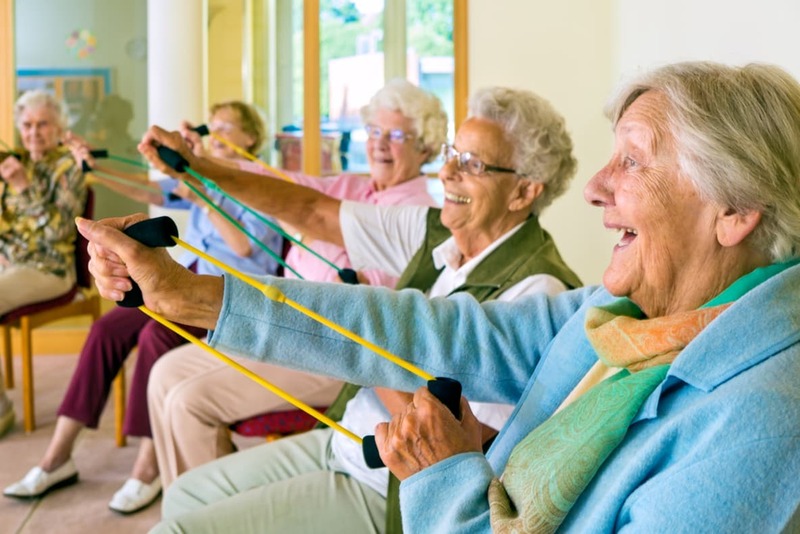 At Chilton House, we realise that our residents have differing needs, which is why we can cater for all types of rehabilitation and exercise, depending on the situation. Our physiotherapy team are always on hand to help with strengthening, stretching, endurance and balance, whether you are joining us on a short term or more permanent basis. If you would like to talk to a member of the team about how your loved one can join us at Chilton House, and enjoy the activities that we have on offer, then please do get in touch.